The performance this month fell short of what we expect from Somar in a month with similar performance from the indexes. Yet this was no normal month. In the wake of the election of Donald Trump as the next US president the markets reassessed their perspective and made violent rotations among sectors. The sectors in which Somar invests were sold. Meanwhile, our companies reported very strong performance in line or ahead of our expectations. So we look to the future with confidence and will take the opportunities the market is giving. The market’s perspective is that a Donald Trump administration will bring higher fiscal spending and deficits and push inflation and interest rates higher. Therefore, investors bid up stocks that benefit from inflation, fiscal spending and higher interest rates like Banks, Industrials and Energy stocks. Conversely markets sold off US Government Bonds. So why did our secular growers get affected? While bond sales funded part of the purchases of more cyclical stocks, more macro stable stocks were also sold. This is probably driven by redemption periods and mandate constraints. The good news for Somar is that our businesses continue to do well and have now 2 additional catalysts going for them: a) If the Trump administration does cut corporate taxes their net earnings will benefit; b) Our companies can execute their ongoing share buyback programs at lower prices and therefore retire more shares than originally predicted. We saw a similar situation in March and April of 2009 when the market bottomed on the last financial recession. For the first 2 months, the more cyclical names rebounded at the expense of the secular growers. That was eventually corrected later in the second half of 2009. In the long run, if our businesses continue to gain customers, expand margins and generate cash, our investments will pay off handsomely. They have continued to do that despite the short term technical noise in the markets. Therefore, we look to the future with confidence at Somar. In November we harvested our first long position. This gives us an opportunity to give you a glimpse of the types of businesses that we look for. While we prefer to be involved over years and not months, we will exit our investments when they hit or exceed our price targets. The strong move over the last few weeks in HealthEquity triggered this. HealthEquity is a leading provider of Health Savings Accounts (HSA). An HSA allows its holder to contribute, compound and disburse funds pre-tax to pay for health care expenses. The HSA market currently has $35 Bn of AUM and is growing at about 20% per year1. HealthEquity is the only player exclusively focused on this product and has been taking market share. Its revenue has grown at a 40% CAGR over the past 4 years. The company is managed by its founder Jon Kessler, who together with his wife, previously founded and ran another successful company in employee benefits (Wageworks, which offers transit cards among other employee benefits). HSAs are a consumer-driven savings vehicle with unique tax advantages. It offers the same advantages of a traditional 401(k) account with the additional advantage of a consumers’ ability to withdraw funds pre-tax to pay for health care expenses. This affords consumers triple tax shelter (contribute pre-tax dollars, invest and compound savings without paying taxes and withdrawing funds to pay for health care expenses without paying taxes). The increasing costs of health care are forcing employers and insurers to gradually shift more of the financial burden and decision-making to consumers. This has led to the emergence of high deductible health plans. To ease the transition and share the savings with employees, employers set up and fund HSAs. This market is still in its infancy and is currently estimated at $35 Bn growing at 20% per year. According to industry participants, it is possible that this industry will grow to $800 Bn. To put this in perspective there are currently more than $4 Tn of AUM in 401(k) accounts in the US (Fig. 2). 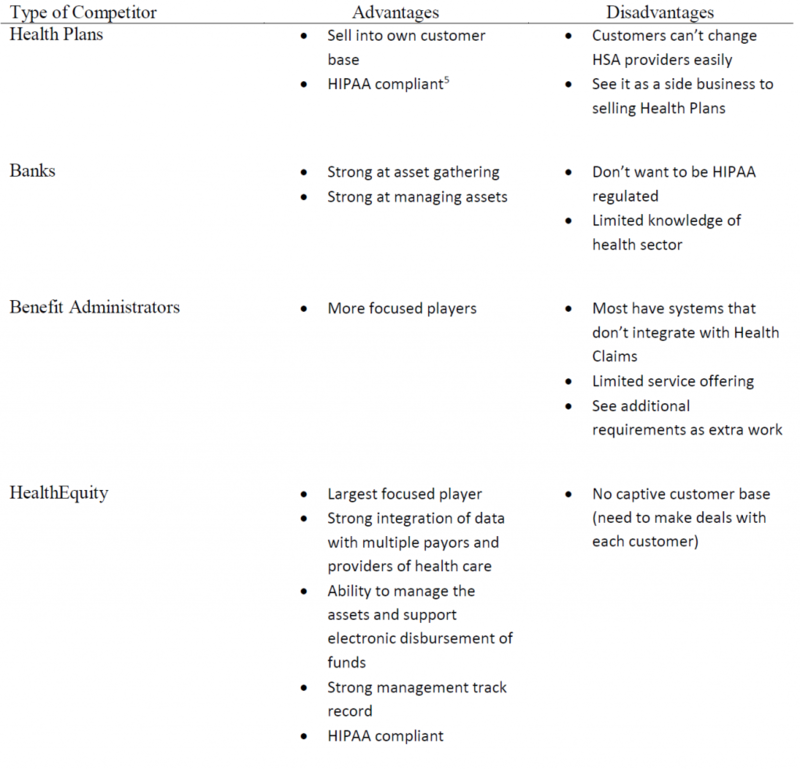 The market is fragmented4 and populated by players for whom the HSA is not the main line of business. HealthEquity is the main exception, being fully focused in the business and taking market share growing at double the market rate (Fig. 3). The strong growth translates into high operating margins as the company benefits from strong operating leverage. Most of its platform costs are fixed and the cost to serve the same customer as his/her account balances grow is mostly fixed. With limited capex and working capital requirements, HealthEquity enjoys triple digit returns on invested capital. This allows it to not only self-fund its strong growth, but also to generate excess cash that it uses to make highly accretive tuck-in acquisitions of sub-scale players. The company has a very strong management team. Jon Kessler, CEO, has a strong track record in the employment benefits space having previously grown Wageworks into a successful enterprise that continues to thrive even after he left to start HealthEquity. Today, Wageworks is a successful listed company with a $2.7 Bn market cap. Stephen Neeleman, Founder and Vice-chair is a thought leader and pioneer in the HSA space having co-authored “The Complete HSA Guidebook” now in its 5th edition. He is also a practicing general and trauma surgeon. Previously he has been an entrepreneur with Morris Air (sold to Southwest Airlines). Somar has been invested in HealthEquity since our launch when the stock was in the high 20s range. Our work demonstrated a very compelling risk-reward. We recently exited the position in the mid 40s as the risk reward was no longer as attractive as the rest of our portfolio. We may get involved in HealthEquity again in the future when we deem the risk-reward highly skewed in our favor. 5 HIPAA – Health Insurance Portability and Accountability Act – which requires service providers to protect the confidentiality and security of healthcare information. A big regulatory burden.